In part one, Karin teaches six basic skills, each followed by projects that will help you practice the skills in a FUN and beautiful way. She covers jump rings, plain loops, wrapped loops, top-drilled loops, crimps, and knots. 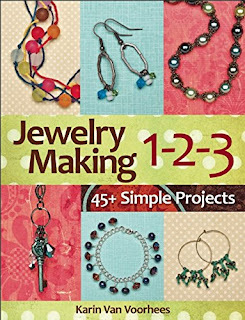 There are no sources given for the materials used, but all items are commonly available through online jewelry making catalogs and at stores such as Michaels. In parts two and three, Karin covers more design-oriented skills, such as using spacers and beadcaps, creating multistrand pieces, choosing between symmetry and asymmetry, designing with brights and neutrals, and swapping out different findings (like clasps) for different design looks. Each of the basic and design skills is covered with a brief but clear series of photos and instructions, and is then followed by three or more beautiful projects. I just can't think of any better way to introduce these skills than to end up with pretty pieces to wear when you're done. Great job, Karin! Thanks for this review! You really understand what I want to offer to beginners -- great, achievable projects!